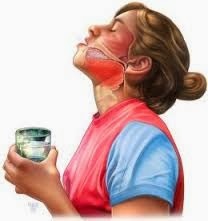 Sore throat is somewhat related to upper respiratory throat infection in which burning or scrathchy sensation causes lots of dry cough. Generally it occurs dure to bacterial or viral infection. Sore throat infection needs to cured completely. Even if small number of bacteria's remains they does not cause cough and it feels like its cured. But during the sleep time they gets multiplied and starts causing irritation in the throat. So it needs to be cured effectively and the following remedies need to be followed once or twice even after you feel its cured completely in order to make sure all bacteria's are killed. 1) Salt Water Gargling : Take a luke warm glass of drinking water and add half a tea spoon of salt into it. Gargle with this twice a day. One just after you get up before having anything and one before going to bed. 2) Honey : Honey is found very effective and quick in order to give relief. Add a little garlic juice in it. Garlic juice helps in killing bacteria and avoid re-birth of the same. 3) Green Tea : Green tea consumption just after lunch is quiet effective. If you are following Salt Water Gargling then just after lunch this is the good option to follow. It has lots of anti oxidants that helps in removing the oil content from the throat and makes it clean.Check Green Tea Benefits. 4) Local heat - Apply a heating pad to the throat region or wrap your neck with hot air dried warm cloth / towel. This will provide relief to the ailing throat. 3) Fast Foods like Burger, Fries, etc.